Worlds of Sound: The Story of Smithsonian Folkways, available now from Smithsonian Books/HarperCollins, is a behind-the-scenes look at the "little label that could," thanks to the indefatigable efforts of Moses Asch, who founded Folkways Records in 1949. Moses Asch believed that all human expression was worthy of preserving, and in 1948 began a life-long odyssey to document the sounds of the world through his new label, Folkways Records and Service Corporation. The Folkways story includes not only the legendary performers who he recorded"including Pete Seeger, Woody Guthrie, Lead Belly, Mary Lou Williams, Phil Ochs, Mike Seeger, and Lucinda Williams"but the amazingly diverse roots of America"s homegrown and adapted musical genres: from folk, bluegrass, and country, to jazz, blues, and sound recordings of every possible stripe (North American tree frogs; the poetry of Langston Hughes; train locomotives; Civil Rights sit-ins and the Watergate hearings). By the time Asch died in 1986 he had released nearly 2200 albums: just over an album a week appearing over 38 years, all under his guiding hand. Folkways became a part of the Smithsonian Institution"s collection shortly after his passing. Today Smithsonian Folkways continues to pioneer the "worlds of sound" Moe Asch first dreamed of 60 years ago. Asch"s vision was expansive and all-inclusive, and World of Sound carries forward that spirit in a rich array of visuals and lively and quirky sidebars. "Worlds of Sound tells a tale that sings, drums, plays, chirps, rings, trills, and thrums. When I was a boy, I stumbled onto a Folkways record of Pygmy music from Africa, and those voices sang directly into my soul. Folkways Records changed my life. 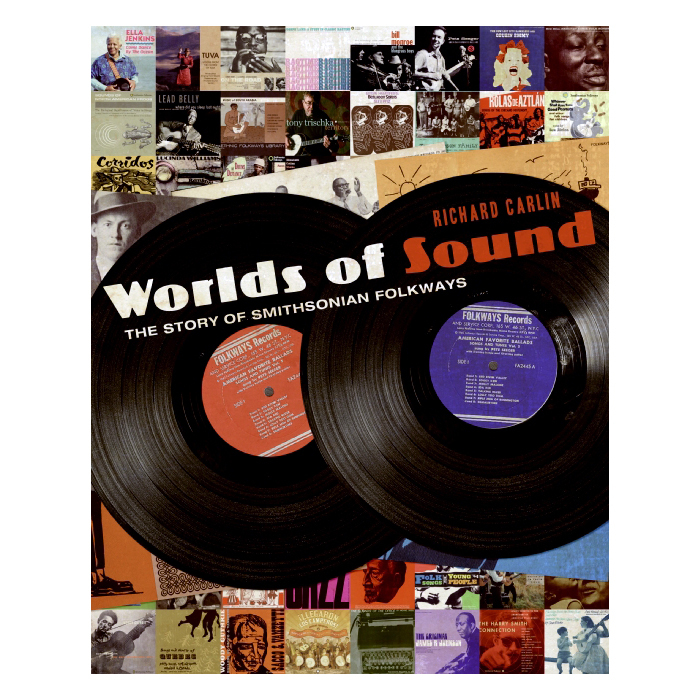 Thank you, Richard Carlin, for telling the Folkways story"one of the most vibrant, exciting tales of all time." "Worlds of Sound is a monumental study that captures the vision of Moses "Moe" Asch and his lifelong effort to preserve folk music in the 20th century. Asch"s unwavering commitment to social justice and his passion for folk music inspired his massive Folkways Recordings, which are a national treasure of recorded sound. Richard Carlin eloquently captures Asch"s life and his recordings in a book that features stunning photography and artwork." "This entertaining romp chronicles how some of the oddest characters in American popular culture—from drugged out record collector Harry Smith to documentarian Studs Terkel—helped Moses "Moe" Asch create a label that is now run by the Smithsonian. Few music histories are as all-encompassing as this one, but whether he's writing about Bob Dylan or the Carter family, Carlin shows a rare combination of authority and passion that makes any reader want to pull out these dusty recordings and feel their magic once again." "Richard Carlin"s Worlds of Sound is an excellent book. So many of the artists featured in this book are familiar to me, and it was a treat to learn their stories through the history of Folkways Records. Carlin really finds the details that make the music come alive—like finding out that Albert Einstein inspired Moses Asch to record all the sounds of the world." Richard Carlin is the author of several books on folk, country, and traditional music, most recently Country: The People, Places, and Events that Shaped the Country Style (Black Dog & Leventhal/Random House), and Southern Exposure: The Story of Southern Music in Pictures and Words (Billboard Books). He has been an editor of music books at Schirmer, Routledge, and currently Prentice Hall. He worked for Folkways Records as an independent producer from 1976-1980, and brings insider experience to his musical expertise and story-telling ability. "I"m not interested in individual hits. To me a catalogue of folk expression is the most important thing."